The panel is a composite consisting of two layers of aluminum skin sandwiching a thermoplastic core in a continuous co-extrusion process. The new generation technology of mechanical and chemical bonding gives Alubond panels exceptional bond integrity. 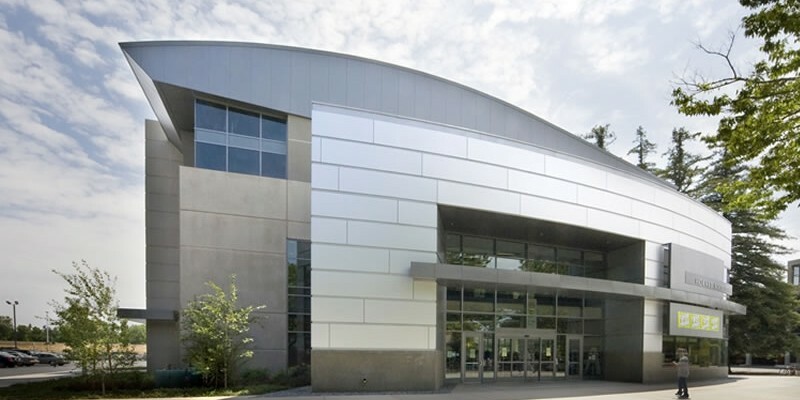 The outer Aluminum skin for exterior grade Alubond panels are coated with PVDF Kynar 500 fluocarbon coatings. The lower aluminum skin is chromate treated and polyester coated. Alumetal futuristic ceiling system is the latest product launch of American building technologies Inc, Denver Colorado, U.S.A. The ever-growing market requirement of an aluminum ceiling system that stands out from the rest has been the primary factor in introducing Alumetal ceiling. The challenge of providing an elegant and functional ceiling system with designer looks and high performance at an economical value has been made possible by the acquisition of state of the art technology and fresh ideas of a young designer team. The result has been an amazing array of 40 exceptional design patterns which have been achieved by perforations giving the system a high level of acoustic performance. Alumetal has been tested for sound attenuation and acoustic performance in independent international labs and test report are provided upon request. An architect’s dream has finally come true! Alumetal Futuristic Ceiling Systems is currently available in Clip-in panel System and Exposed Grid panel system. The option of perforated and plain patterns offer an attractive monolithic ceiling appearance with design freedom. Alumetal is available in stove enamelled as well as powder coated finishes. The system can be supplied in custom made colors both in metallic and solid colors. The ceiling panels are available in standard 600+600mm as well as 300+300mm dimensions. Specialty access panels are designed to be integrated for easy access to services and a range of lighting accessories compliment the Alumetal Ceiling System to make it a complete ceiling solution. The wide range of 40 patterns makes it an Architect’s dream to provide designer ceilings at an economical cost. Alumetal Futuristic Ceiling systems are available in a standard range of forty design and perforation patterns making it arguably THE LAGEST SUPPIES OF PERFORATED RANGE IN THE WORLD amongst the recognized international supplies. These patterns provide between 8% to 40% perforated area giving the option to the Architect/client of a truly elegant designer ceiling system with high acoustic performances. ALUMETAL Futuristic Ceiling Systems allow for a high level of sound absorption and attenuation. Ceiling panels are available with or without non-woven acoustic infill material bonded into them during manufacture. Infill materials are black or white non-woven acoustical tissue that produces excellent sound absorption. Alternatively, black film can be specified to reduce air movement and dust penetration through perforations. Mineral wool acoustical pads can also be supplied in a wide range of thickness and densities.